Measuring 5.0×3.7 inches, the RC™ embedded controller offers a wide array of flexible analog data acquisition and control features to support industrial instrumentation. It is designed to directly measure up to 16 channels of analog inputs at +/-10V, and output analog outputs at +/-5V. The RC is designed to directly measure up to 16 channels of analog input signals at +-10V, and outputs analog signal at +-5V. It is ideal for an OEM product or application which requires mass local data storage, communication via Ethernet, USB, RS232/485/wireless. The RC supports TTL I/O lines, a LCD interface, solenoid drivers, and an on-board precision temperature sensor with 0.0625 C resolution. 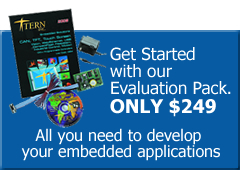 Additional I/O, ADCs, UARTs, counters, high voltage I/Os are available by using TERN expansion boards. The RC is C/C++ programmable with TERN’s development platform. Ready to use demo frmware can be loaded into the on- board Flash memory. A sigma-delta 24-bit ADCs (LTC2448) can be installed to provide 16 input channels. Each channel is buffered by OP circuits to allow +-10V analog inputs. True 16-bit resolution can be achieved. Variable speed/resolution settings (up to 1 KHz) is available. A 16- bit DAC(LTC2600) with output buffers provides 8 analog output voltages (+-5V). Mass data stored on a local CF card (up to 2 GB) can be easily transferred to a PC. FAT16 fle system libraries are provided with the development system. A real time clock (RTC72423) can provide clock/calendar for time stamp usage. A UART (SCC2691) supports RS232, or RS485, or ZigBee wireless. On-board sockets and demo software are available to support XBee and XBee-PRO ZB embedded RF modules (www.digi.com). A CPU internal UART is used as RS232 DEBUG port. Three internal timer/counters can be used to count or time external events, or to generate PWM outputs. An optional 10/100-baseT Ethernet module and a slave USB port can be installed. Over Fourteen PIO lines can be used to drive temperature IC-Sensors. Seven solenoid drivers are capable of sinking 350 mA at 50V per line, and they can directly drive solenoids, relays, or lights. A high-performance USB stack chip to provide an easy to program USB 1.1/2.0 slave interface. The onboard hardware fully handles USB stack processing, and provides for high-speed bi-directional 8-bit parallel communication. 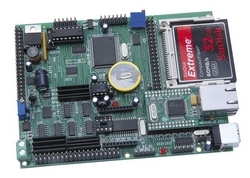 The hardware interface includes 384 bytes of FIFO transmit buffer, and 128 bytes of FIFO for the receiving buffer, making this an ideal low-overhead solution for all embedded applications. No USB specifc frmware programming is required on the controller side. The RC uses 8.5V to 12V DC power supply with default linear regulator or up to 30V DC with switching regulator without generating excessive heat. It can be powered with 5.1V-9V DC while low drop regulators (TPS765) are installed. A 16×2 line character LCD can be installed.